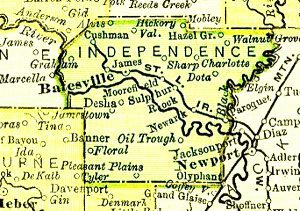 Independence County was the ninth county to be formed in Arkansas and was the fourth after the Territory of Arkansas was created. The Act creating the county passed by the Territorial legislature was signed by Jas. Miller, governor on October 23, 1820. One of the first settlements of Arkansas was at the Batesville site. There is a record of a John Read opening a store there in 1812 and there is also an authentic record of John Luttig’s store, which had a $5,500 stock of goods at the site in 1815. Poke Bayou was visited by the writer Henry R. Schoolcraft, who described it as a village of a dozen houses in 1819. The county has been well known for its manganese fields, marble quarries and lime plants. Traditionally an agricultural area, the county has been a producer of row-crops and livestock, including beef, dairy and hogs. The Batesville-Floral area was a pioneer broiler producing section of Arkansas, and, today, the poultry industry in the county is an important source of employment and income. Independence County, the City of Batesville, and Lyon College, have entered into a developmental enterprise for the construction of three hydroelectric generating plants at Lock and Dams 1, 2 and 3 on the White River. The project consists of using timber-crib and rock locks and dams built by the U.S. Corps of Engineers in circa 1900 -1908. The power (approximately 12.00 MWH) from the plants is being sold to the Clarksville Light and Water Corp., Clarksville, Arkansas, under a 30-year power sales and purchase agreement. The first plant, Lock & Dam #3, went on line in August 2006 and the remaining two are due to be complete in 2007.